Take a stroll through a golf shop and one will notice that there is no shortage of high quality golf apparel on the market. Consumers often have to make the choice between classical solids or brighter colors with more wild patterns. 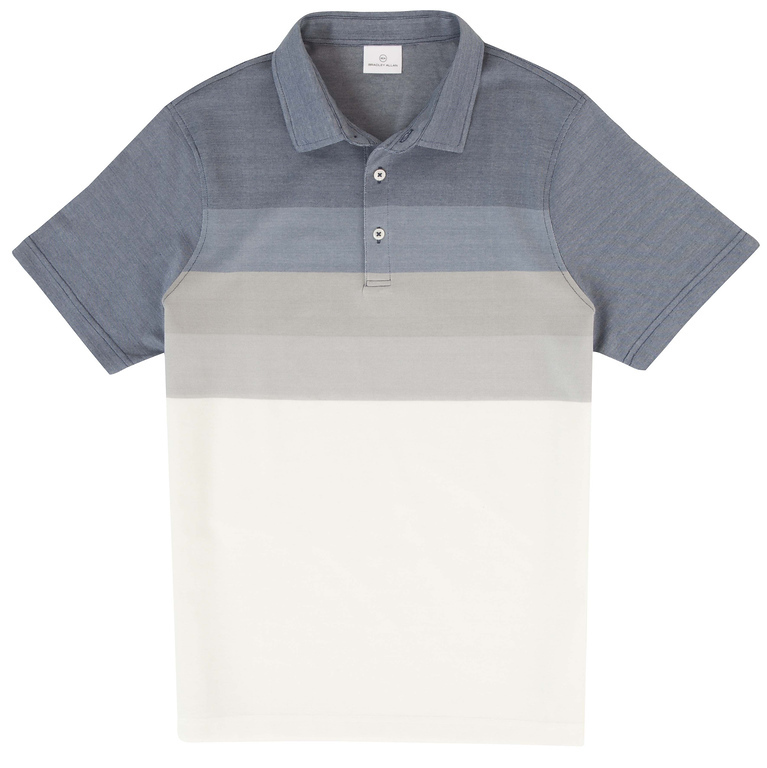 For the golfer who tends to go from the workplace to the golf course, that sometimes leads to either sporting something that might be a little too loud for the office, or wearing an office friendly polo to the golf course, while sacrificing some performance from the less technical material. Enter Bradley Allan, a new golf apparel brand that aims to combine the high performing materials, with a more refined style. Brad Franklin is the founder and creative director behind the new Bradley Allan golf apparel brand. A quick glance at his resume and there are a number of brands that just leap off the page, including Dunning, Tommy Hilfiger, and AUR. 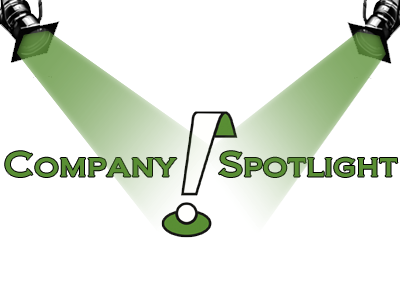 Serving as the Head of Design for the latter two companies helped prepare Brad to start a new project, a new company, with a classic yet modern look. After spending time at these previous companies, Brad discovered that there was something missing from today’s golf apparel. Filling this void is what Bradley Allan aims to accomplish. Peruse through the Bradley Allan website and instantly a design trend is evident. Bradley Allan golf apparel offers up a fantastic design choice for golfer’s who want to enjoy an elegant style, with the performance of enhanced materials. Brad Franklin’s vision was to create a line of apparel that would not cause players to sacrifice the high performing material while enjoying a more sophisticated style on and off the course. 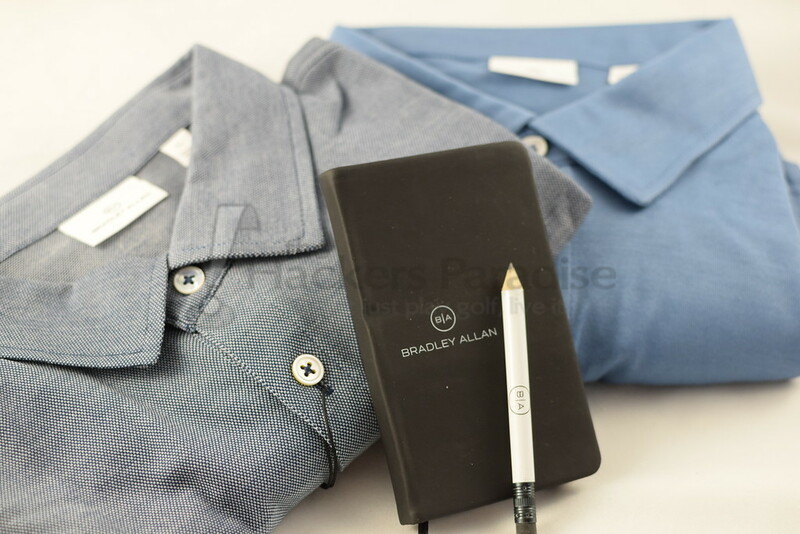 Currently Bradley Allan offers seven different polo designs, each coming in with at least three different color variations. The two offerings that were sent in for the purpose of this review were the Oxford Pique Gradient Polo in cadet, and a solid polo in pilot, which is a nice shade of blue. Finding a polo that is the correct fit is part of Bradley Allan’s mission statement. Even though it’s design is on the tailored side, the brand’s main purpose is to find a shirt that provides the absolute perfect look. 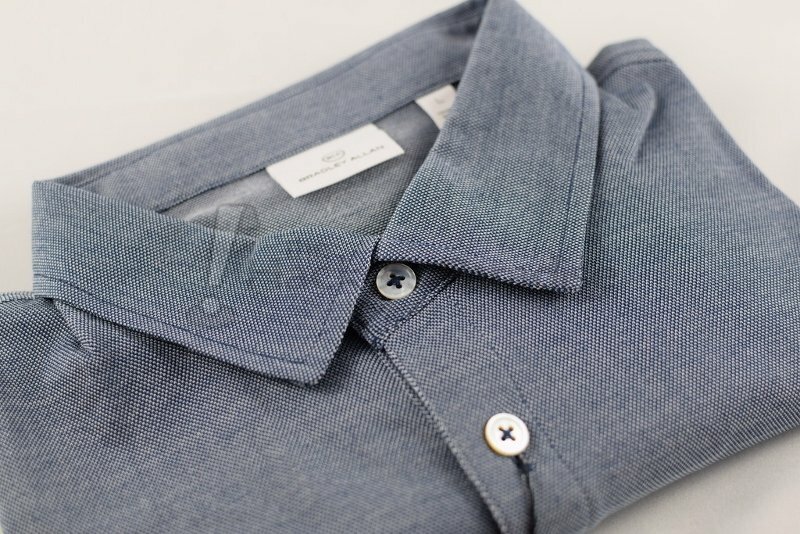 The style of these polos offer a great deal of versatility in terms of fit and design. Lengthwise, these polos hit that perfect length that allows them to either be tucked in while on the course or at the office, to sporting them untucked for a more causal appearance. The sleeve length hits just around the middle of the bicep, helping to keep this refined style intact. 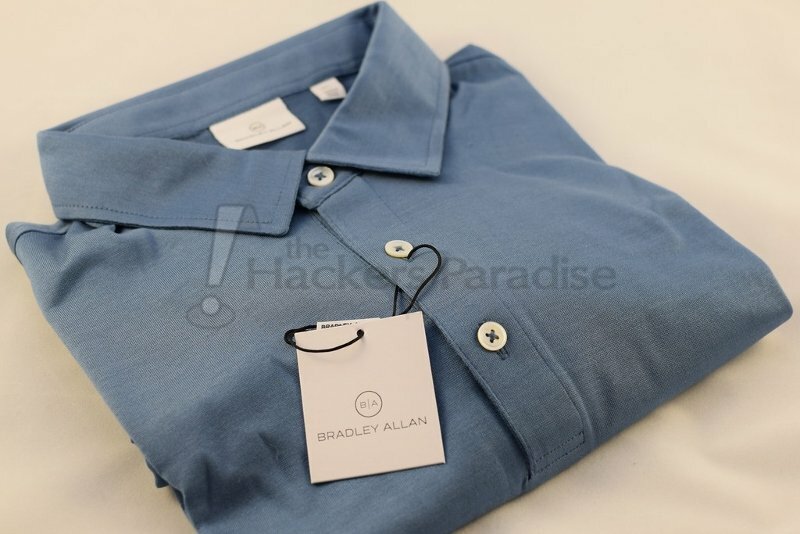 One thing that is recommended when selecting a Bradley Allan polo is to consider going up a size. Brad Franklin has produced this line of polos with a majority of cotton, which is blended with a small amount of polyester. 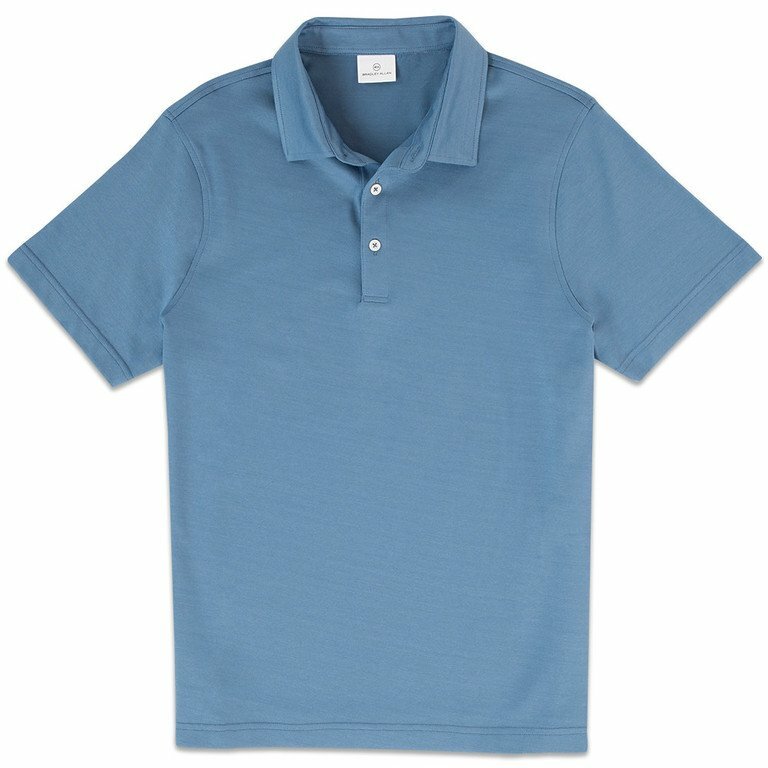 This material does a terrific job of creating a polo that feels very soft, while still retaining the ability to keep the player cool and dry. It is also easy to maintain as the care instructions are simply to wash with cold water and then tumble dry low. Word to the wise, even though these can be dried on low heat, it should be noted that during a drying cycle the polos did seem to shrink a touch. While the lineup of Bradley Allan apparel is still very young, it’s hard not to be impressed by the articles received. This lineup seems to do a lot of things right, from the stitching around the cuffs and collar, to the understated logo on the upper back. They may not garner immediate attention with any sort of flashy designs, but those who notice the finer details will certainly like what they see. In a market with lots of apparel choices, it’s refreshing to see a new company come out with not only good classic designs, but the craftsmanship to go along with it. Prices for these polos start at $79 and range up to $89. More information, including a look at the other polos and pieces of apparel offered, can be found at www.Bradley-Allan.com. This looks a line that’s right up my alley. I love that grey striped polo. Definitely going to keep an eye out on these, thanks for the great writeup Dean.